The concept of children’s alcoholism is described by specialists as expression of typical features till age of 18. Children’s alcoholism is one of the most terrible diseases of contemporary society. It became to develop actively at the countries of the former CIS during post-Soviet era. Before, the approach of health lifestyle compliance, as about adults, so the youth, was the same: there were the attempts to solve the problem through prohibitions, controlling and prophylaxis. It wasn’t very effectively, but at least the indicators were more sedative. It is known that alcohol consumption in Soviet Union wasn’t welcomed, and soberness was appreciated as one of the best virtues. Professional-psychologists say that with breakdown of Soviet Union the moral constraint factor of public reprehension has disappeared, that in turn made the drinking of alcoholic drinks more allowable for different population segments. Many who remember how the attitude to alcohol has changed nowadays. Determination, formulation of disease has stayed the same, but the sins expanded – the availability of alcohol, weakening of control over its drinking and so on. Such “novelty” became that psychological factor which made its effect on increasing the drinking population percentage during post-Soviet era. The heightened problem actuality was dictated by this that days, and over the years it has worsened more. Alcohol availability and forbidding drinking became those psychological factors, which played main role in increasing of drinking population percentage during post-Soviet era. Naturally, it is impossible to say that during USSR the methods of fight against the excessive consumption of alcohol were ideal, but this question was under relentless control of state agencies. It’s worth noting, that young alcoholics have made progress in “becoming younger” compared to children age having consumed alcoholic drinks during post-Soviet era. Earlier the age of young people, who suffered with disastrous love to an alcohol, was 18 years on a average. 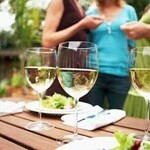 Nowadays young alcoholics are children of age 13-14 years. Well known such occasions when alcoholic dependence is formed at children who are just 3 years old. Needless to say that such trend is not just frightening, but really terrible and menacing to future of whole nation. As a rule, the reason of children’s drinking is adult inattention to problems of developing personalities and their needs. getting from the parents pocket money (often children and teens spend them not for going to the café or a cinema, but for a beer, which is drunken in a company of so called friends). We can list also other problems, which often become the basis of alcoholic dependence at children, but even the listed factors allow imagining the common mechanism of children’s alcoholism formation. Children, as a rule, drink in a company of peers or children a few years older, who encourage the desire to seem steeper due to use of alcohol. In a company of adults the children drink much less but such occasions are also met. 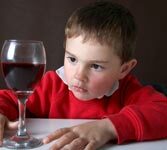 We should notice that children alcoholism nowadays has managed to achieve huge sizes. For sure every of us has seen as schoolchildren in brakes of studies buy from stalls and small shops, situated near the school, different snacks: crackers, chips, corn sticks, nuts and so on. It is not a secret how often we can see as the schoolchildren often bye low alcohol drinks – beer mixes, rum cola, beer or shakes. Between the children of school age the sweet low alcohol drinks are the most popular, which vary little from lemonade, Pepsi or other kinds of sweet aerated water. The producers of low alcoholic drinks consciously make the production with low alcohol content, which reminds lemonade much, because it is a universal product, which is popular equally among the children and adults. Such drinks are often perceived as usual soft water or even worse – as a drink, which is drunk instead of juice or mineral water at meal. Naturally, thus, there are formed wrong conceptions in children’s brains about that why the alcoholic drinks exist. Children used to ability of quenching the thirst, drinking the bank of “Longer” with pleasant citrus taste or treating themselves to the next beer novelty with fruit smell. The child, who drinks low alcoholic drink, often imagines that it gives him “coolness” in friends’ eyes, and also extra significance among adults. Should we say that drinking child – is sad spectacle, which doesn’t instill the respect? One of the schoolchildren’s problems is that they can’t control themselves, drinking alcoholic drinks. That is why children often get drunk much in pursuit of an attempt to show they cooler and more adult. It’s clear that there are nothing good accepts the problems with health and changes of normal behavior models for a schoolchild. Many children sincerely think that consumption of beer isn’t that harmful habit, which brings to development of beer alcoholism but is a decent employment of maturing schoolchild. Beer alcoholism, spreading among the children with unprecedented speed, is one of the most dangerous kind of alcoholic dependence, wherein the child should increase the dose (in this case – beer). Congenital alcoholism is a disease, which practically doesn’t give the chance for child’s life. The babies suffer from this kind of alcoholism, whose moms and dads abuse with alcohol at the stage of their conceiving and childbearing. Alcoholic drinks can provoke serious deviations in fetus formation and all vital organs and systems of a baby’s body. Besides, the baby with congenital alcoholic dependence used to get regularly dozes of alcohol, being in womb. Such child regularly demands new and new dozes of alcohol, crying and being capricious. It is known situations, when such child almost instantly calms down, if the parents wet his lips with of alcoholic drink. The most tragically in this situation is that the parents guilty themselves that their child draws the first breath with congenital form of alcoholic dependence. Nowadays there are no doubts that children’s alcohol dependence is the most dangerous disease, which destroy child’s organism, which hasn’t had time to form yet and also the child’s psyche. Even if the child drink alcoholic drinks occasionally, it will be surely reflected on a health and forming his personality. As a rule the relations with parents, teachers, and friends are ruined and even with unfamiliar people. Besides, child alcoholic dependence develops much faster than similar from adults, that is also an additional factor of risk. The regularly consumption of strong drinks (even if they have low content of alcohol) negatively effect on right and adequate development of heart and blood vessels, production of hormones, conduction of nerve impulses and psychological condition of a child. We can’t forget that child organism is felt under devastating impact due to unfinished processes of growth. Specialists say that children even more fall under the impact of alcohol than women. the devastating effect on a brain. By these aspects the harmful and detrimental effect of alcohol at a child’s organism is not limited, but the marked paragraphs are the most important. Alcohol is more dangerous for children than for adults, also due to that in a growing body the amount of hormones, which are able to decompose the alcohol is much less than in adult body. the development of normal emotional reactions and responses. Rave and convulsions, caused by alcohol drinking, is rather common reaction at the alcohol for children and teens. As a rule, a child begins to rave when he goes to sleep after an alcohol drinking. And during it the convulsions can appear. At children, who regularly drink the alcohol, the alcohol withdrawal syndrome can form. 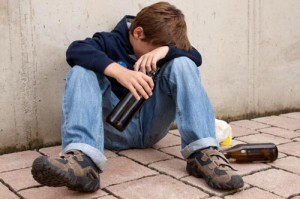 The general deterioration of health and mental state – is usual consequence of a child drinking of alcohol. intermittent periods of activity and inactivity. Children’s alcoholism – is one of the most serious problems within the territory of former USSR. It is here after the fall of soviet regime he alcoholism began to develop by unusual rapid tempos, covering new and new age groups. The statistic data says that almost half of children at age from 13 to 17 drink the alcohol regularly. It is not a secret that alcohol selling in Ukraine (including low alcohol drinks) is forbidden. Despite of government ban on sale of alcohol for children, many of entrepreneurs go on to defy the law, selling the alcoholic drinks to children. This is easily explained, because children –is a contingent, which forms not small share of profit for owners of small stalls, where the sweets, snacks for beer and beer itself and low alcoholic drinks are being sold. So the owners of such small stalls absolutely forget about moral principles and the future of their country, engaging in encouraging of children alcoholism. Naturally, nowadays we are talking not about all entrepreneurs, but about some part of businessmen, who don’t care about welfare of younger generation. Luckily, nowadays the conscious entrepreneurs and sellers are still can be met, who don’t sell alcoholic drinks without presenting of ID card (the sellers have to demand the documents in that cases, when they have suspicions about the age of buyer). One of the prophylactics, which can surely effect on child’s alcoholism, is a prohibition of advertising campaigns of alcoholic drinks. It is not a secret, that many of commercials and printed promotional products are directed to carry on propaganda underage buyers for buying low alcoholic drink in a bright packing. Such commercials promise the children’s social success, the authority of peers and adults and also the raise of self-importance sense. The children, disadvantaged with parents’ attention and having complexes, are often fallen into this trap, becoming new buyers of low alcohol and strong drinks. The troubled families are not the only environment of children’s alcoholism emergence. Full families also often become the victims of children’s alcohol dependence. Sometimes the troubles in families and also the negative example of peers become the reason of that the child makes the first steps alcoholism formation. Psychologists say that children, growing in wealthy and rich families, often become the firsts who are trying an alcohol and begin to drink it permanently. It’s often tied to the fact that the parents are busy all the time and can’t spend the time with their children. Thus, at a child the subconscious desire “to avenge” the parents can develop because of lack of attention from them. Nowadays, there are no doubts that children’s alcoholism is a great problem for former CIS countries. Furthermore, there are no any doubts about that it is necessary to engage in treatment of children’s alcohol dependence, because it effects on the future of growing up generation. 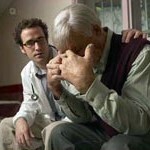 ask for help to psychologists and experts in narcology. The specialists’ experience shows that the treatment will be effective if the parents are sincere and really ready to do everything that listed above. We should remember that children feel at once any insincerity on the part of adults.It means that a child at once feels the mother’s and father’s relation, and also do they really want to discuss with him his life and problems. And if the parents aren’t interested in taking part in their child’s life, then the child, most likely, will take the problems outside and wait for the help from older friends and peers. Not rare the cases when friends and yard guys force the children o drink alcohol, smoke cigarettes and even drugs, which supposedly help to solve the problems, forgetting himself and relaxing. One of the advices which the specialists give to parents is sounds like that: captivate your child with that what is interesting for him (hobby, leisure activities, studies…) and there will not be time for nonsenses. Besides, you should spend as much as possible time with your daughter or son. The example and support of the parents is one of those powerful incentive, which can change the child’s life totally and to give him the opportunity to feel the love and care from mother and father. You can’t brush aside a child and his hobby just because one of the parents doesn’t partake it. It is necessary to show the sincere interest. Those parents, who can’t understand their children’s hobbies, should think that the understanding child’s hobby is on their own account, because it is a uniting factor. Spending the time with the daughter or son, the adults will help a child’s intellectual development, and weaning him from harmful habit and destruction of strong psychological craving for alcohol. Children are that type of alcoholics, which is rather easy to have an impact on. We surely have to use it, saving the future of own hearth and home. controlling by official authority and laws ratification, which forbid advertising companies, making propaganda of alcohol among children and teens (psychological tricks in advertising, directing to “hitch” this particular audience). i am diabetic and 22 years old (i’ve had type 1 since i was 8) .i have a drink oaclsionacly, but i dont drink beer (loaded with carbs) i usually drink sugar free redbull and vodka .it has never had much of an effect on my blood sugar but then again i dont let myself get drunk so i dont lose control. i had a diabetic friend die at the age 17 due to the fact that she funnelled way too many beers at a party and passed out and no one realized her blood sugar had shot up above 1000 and she flat lined and never came out of a coma. everything should be done in moderation.